Last week I spend a couple days on Cape Cod and pursued some sunset photography at Paine’s Creek. It’s one of the most popular sunset spots on Cape Cod and parking comes not easy. What I didn’t expect was a beach filled with kayaks. Sea kayaking is a popular outdoor activity on the Cape and kayakers were paddling towards the beach during my sunset photography. 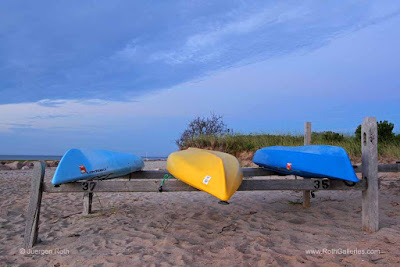 After setting up just in time, patiently waiting for paddlers to move out of the composition and capturing a beautiful evening sky I turned all my attention to sea kayaks that were stacked on racks along the beach. In this first picture I zoomed in on the rack of kayaks but kept part of the beach and a picturesque cloud formation for additional interest in the composition. The colorful paddling boats stand in nice contrast with the monotone of the twilight sky. In the second picture I moved a bit further out to capture a couple of racks stored with ocean kayaks. I incorporated a bit more beach and sky for the viewers to explore and step onto the beach within my photograph. Mosquitoes were a pest that night and got me pretty well. I am glad though I stayed around to take these outdoor adventure photos. The sky and cloud formation also turned beautifully and made for some additional peaceful Cape Cod Bay photography. 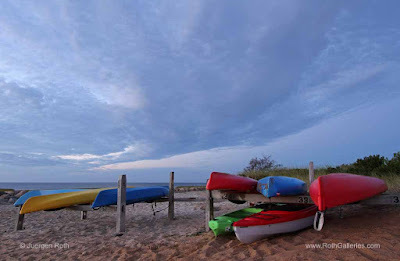 During my routine post processing workflow I removed dust spots, straightened the horizon, minimally adjusted, lighting, contrast and color saturation before sharpening the final image of Cape Cod Kayaks.